So, I've been researching cellular respiration on my own, and trying to keep track of most of the major processes. 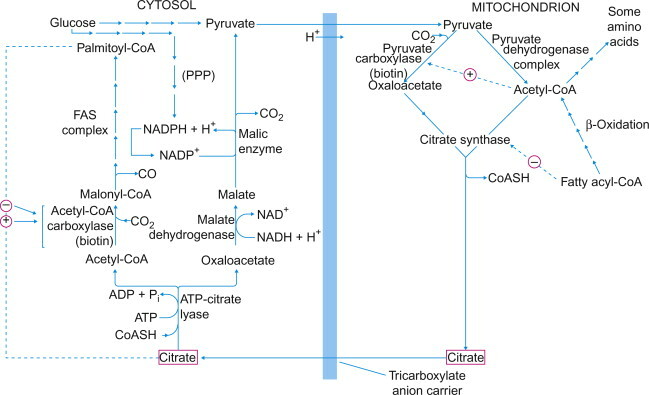 However, I do have one question left: I can't seem to find any sort of information about how Coenzyme A (I think it's made in the cytosol) is transferred to the matrix (the inside of the mitochondria, inside the inner membrane). Is it transported with a shuttle like for NAD+/NADH, a translocase like for ATP/ADP, or something else? Thank you for your time. CoA synthase is localized on the mitochondrial outer membrane. Moreover, we demonstrate for the first time that phosphatidylcholine and phosphatidylethanolamine, which are the main components of the mitochondrial outer membrane, are potent activators of both enzymatic activities of CoA synthase in vitro. Taken together, these data provide the evidence that the final stages of CoA biosynthesis take place on mitochondria and the activity of CoA synthase is regulated by phospholipids. I think this can clear your doubt...As it shows how the transport is done between the matrix and cytosol.. And it also explains the presence of coenzyme A ie CoA SH at both the sites. Not the answer you're looking for? Browse other questions tagged microbiology cellular-respiration mitochondria or ask your own question. How do the first and second law of thermodynamics adhere to breakdown of glucose? Why don't protons diffuse out of the mitochondria during chemiosmosis? Is the number of protons in the mitochondrion sufficient for ATP synthesis? How can the leakage of mitochondrial protons generate heat?